Rapper King Kaka has opened up on how he managed to evade being arrested by police recently in the US. 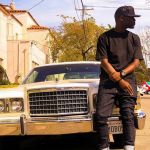 Speaking to Mazazi Willy M Tuva in a phone call, King Kaka who is currently in the US said that he was taking photos in the middle of the road at night which is illegal in Los Angeles. Close shave While in the act a cop pop out of nowhere and arrested him but King Kaka managed to escape being taken to jail after telling him he’s a rapper from Kenyan who has worked with Tracy Morgan. Surprisingly, the cop remembered him and forgave him. “Nilikuwa na marafiki zangu napiga picha LA katikati ya barabara which ni violation. Polisi walipokuja wakanishika pamoja na rafiki zangu. Lakini kabla watuingishe gari nikawaaambia ‘I am King Kaka’ it’s my last day in LA because I am headed to Silicon Valley. ” I told them mimi ni rapper kutoka Kenya and I have worked with Tracy Morgan akanigundua akasema ‘Aah nimeona interview yako ,najua nyimbo yako na Tracy Morgan. You are a Kenyan I have to let you go.’ Akaanza kuniambia profile yangu. ‘Najua unafanya sanitary towels, wewe ni msanii mkubwa Kenya.’ Tukapiga picha nao,ilikuwa nzuri,” King Kaka revealed on Mambo Mseto. The post King Kaka almost arrested in the US for taking photos in the middle of the road appeared first on Ghafla! Kenya.